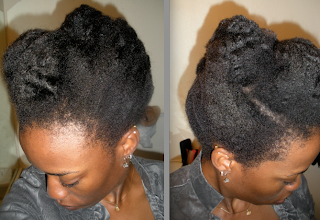 • To create a sidehawk; to create a bun on loose, stretched hair. The best thing about the spin pins is that they are gentle, easy to use, and a timesaver. 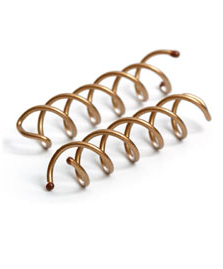 (They are much gentler on my super-tight kinks than bobby pins.) In my opinion, they are on the expensive side ($5.19 at my local Target vs. $7.99 at my local CVS). 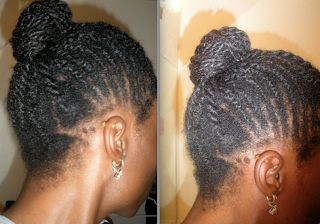 However, you can get your money's worth by using them for various creative updo styles beyond than the simple bun. 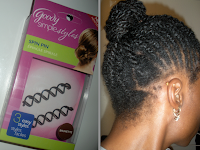 They are ideal for ladies who steadily wear updos -- including me. At the moment, I'm still partial to my ouchless band, jaw clip, and single frenchbraid ... but the spin pin may become a good friend in time. RATING: Overall, I give the Goody Spin Pins 4 out of 5 stars. The ultimate question is can they do the work of 20 bobby pins? On my thick hair, not really, but they did the work of 5-10, which is still pretty cool. Additionally, it would be great if they could offer "black" spin pins in the future. Thanks for the review. I've been seeing these around and wondered if it was worth the investment (they are pricey). I recently picked up some Good Hair Day pins. So far I like them. You're welcome, CallaLily! I've been hearing about the Good Hair Day pins; the price looks reasonable. OMG Loo!!! I've never seen these magical little devices before. I'm SOOO going to target for some. Thanks for the review!! very cool; i've been interested in these ever since i saw the commercial. @Dani: You're welcome. I can't wait to see how they look on your hair!! @Melyssa: Same here. I just had to try them! @Jc: Yes, it's kind of hard to explain. The pins came with pictures, which is more useful than just putting into words. Thank you!! I have been reading a lot of positive reviews for these pins lately, and your post has just convinced me. ;-) I wear buns four days out of the week, so I can't wait to try this.